Where? 2.8 million kilometers to go, shuffling along at 1.2 million kilometers every day as of midnight this morning, July 12th, in Virginia Beach, Virginia. Sunday. Pluto is about 170 pixels across in the LORRI camera, but to the naked eye it’s around 10 percent the size of the full moon. Where to? Pluto! At 7:48:54 AM, July 14th Washington D.C. time, (11:48:54 GMT), plus or minus 37 seconds or so. Where from? The blue-green planet with the high albedo and lots of salty liquid water on the surface. 6:00 AM: The Sun rises at our hotel overlooking beautiful Lake Kittamaqundi in Columbia, Maryland. In a half-hour Jan will drive me to APL about 15 minutes south from here. 7:19 AM: Jan drops me off at the APL back entrance and drives back to the hotel for breakfast. I come into the lab, elevate to the fifth floor of our building, and walk into the “Bullpen” where doughnut holes and coffee await. The Bullpen is a large-ish room where the Navigators and some of the Science folk hang out. 7:50 AM: We finish our daily huddle outlining what we’re up to today. There are two OpNav deliveries, Crit 36 and Crit 37, and two corresponding “OD” (Orbit Determination) deliveries combining the radiometric and OpNav data sets. At this late date, OpNav rules. It’s much more powerful than the radiometric, nailing down both our location in the target plane and our arrival time. The first solution is due at 10:06, we’ll have an hour from then to prepare a presentation for the informal “OD Conclave” meeting at 11:06, and then a formal Mission Management Meeting at 2:36 pm for announcing our delivery to the project at large. Processing for the second OD delivery, Crit 37, starts at 11:36, and gets wrapped up in the final formal meeting ending at 12:26 tomorrow morning. We’re hoping the solution will be so non-controversial that it can be finalized earlier, around 7 PM this evening, so we can take the rest of the day off. Dale, Chris, and Jeremy are prime for the OD solutions today. Bobby and Fred run the show, put together the slides, and give the presentations. Ken works on generating Monte Carlo statistics for the slides. Coralie and Derek (and Philip back at home base in California) get a little rest before starting the Crit 37 optical data. I watch all, absorbing sponge-like as much as I can to write omnisciently on this page, pretending to know what I’m doing, but it’s hard to keep up. I’ll tackle my own OD processing in a few minutes, shadowing Dale or Jeremy probably, but in truth I’m slow at this process, not nearly as nimble at the keyboard as the younger whippersnappers, so I mostly provide reality checks here and there as I can. Coralie emailed us late images of Pluto and Charon, with a single comment in her text: “:)”. Craters begin to pop out. 3:15 PM: The Crit 36 delivery was made. Not much movement in the target plane, but the arrival time drifted a little earlier by about 6 seconds with a uncertainty of about plus or minus 36. Although the Navigation Team recommends that an onboard update be done, we’ll be neither surprised nor disappointed if it isn’t approved, since most of the possible trajectories (from the Monte Carlo analysis) still fit in the desired design space. The Crit 37 OpNav data was delivered a little over an hour ago, and the OD Navigators are working on the next set of solutions. So far, no surprises and none expected. All is well. 6:40 PM: It is done! The Crit 37 solution, which is the last one before the flyby, is finished and delivered. It’s close enough to the last one that there’s no reason to risk a failure by updating the onboard sequence. The late night meeting is cancelled. 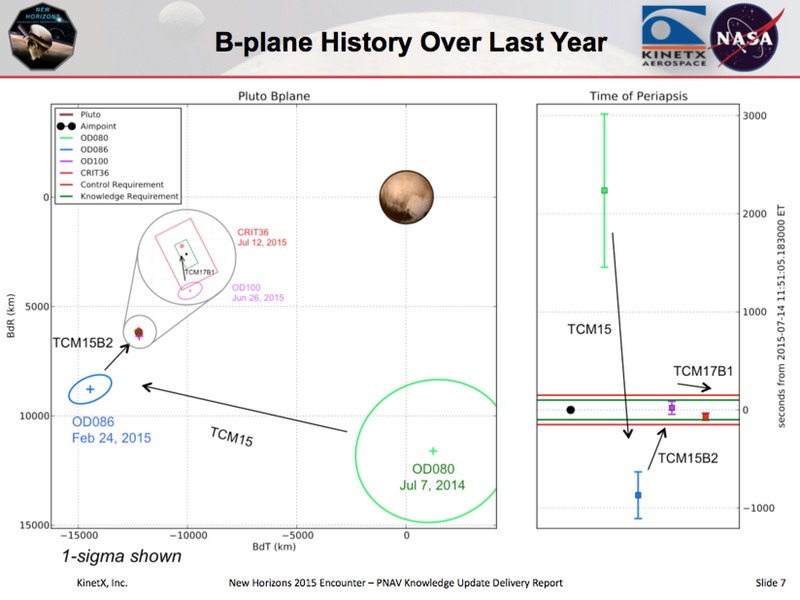 There is no update, New Horizons flies on, and Pluto looms ahead. There is nothing more that can be done. Time for the Navigators to take a deep breath and enjoy the rest of the show! This entry was posted in Blog, Navigating Pluto, Spacecraft Navigation and tagged deep-space navigation, navigation, New Horizons, Pluto, solar system, Spacecraft on 2015-07-12 by Black Sky Voyages. Where? 4.0 million kilometers out, getting 1.2 million kilometers closer each day, as of midnight this Saturday morning of July 11th in Columbia, Maryland. 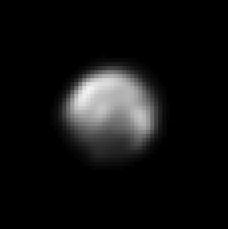 Pluto is about 120 pixels across in the LORRI camera, but to the naked eye it’s only 7 percent the size of the full moon. Where to? 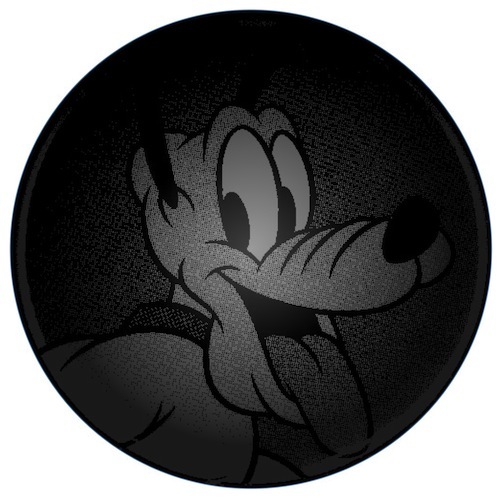 Pluto! At 7:49:02 AM, July 14th Columbia time, plus or minus 47 seconds or so. Yesterday afternoon the Navigators recommended to the project that an update to the onboard sequence be made, since the current solution location in the target plane (think of it as the throw of a dart) and its corresponding cloud of uncertainty has drifted towards the top center of the 65 x 130 kilometer box that represents the acceptable region for the flyby. It’s actually a cube rather than a box, since there’s also a limit to the acceptable arrival time of 200 seconds centered on 7:49:49 AM Columbia, Maryland time. If the trajectory goes through that box and the spacecraft closest approach is within 100 seconds of the desired time, all is well and the current design is good. If it goes outside that box/cube, then either some science data may be lost, or the sequence will need tweaking to make the observations optimal again. The Navigation Team recommendation was to upload a tweak to the canned-in spacecraft sequence design to guard against a drifting solution, essentially re-centering the cube around the current solution. The independent Navigation Team agreed. The Science Team agreed. The Mission Operations Team agreed. The mission leader didn’t agree. Alan Sterns’ reasoning was that there’s too much risk of missing the whole flyby if the spacecraft should go into safe mode again, like it did on July 4th, an unanticipated event. If that happened, it’s quiet possible that the spacecraft couldn’t be returned to normal operation in time for the flyby, resulting in a loss of almost all of the mission objectives. Better to risk some suboptimal science observations than the whole mission. Nobody wants that, not the scientists, not the engineers, and not the Navigators, so there has not been any grumbling about the decision. It was justified. Today we processed Crit 35 optical navigation data. The good news is that the mild solution drift we’ve seen in the last few days in both the target plane and the arrival time seems to have abated, and the error bounds continue to shrink up around the solution. My wife just landed in Baltimore. 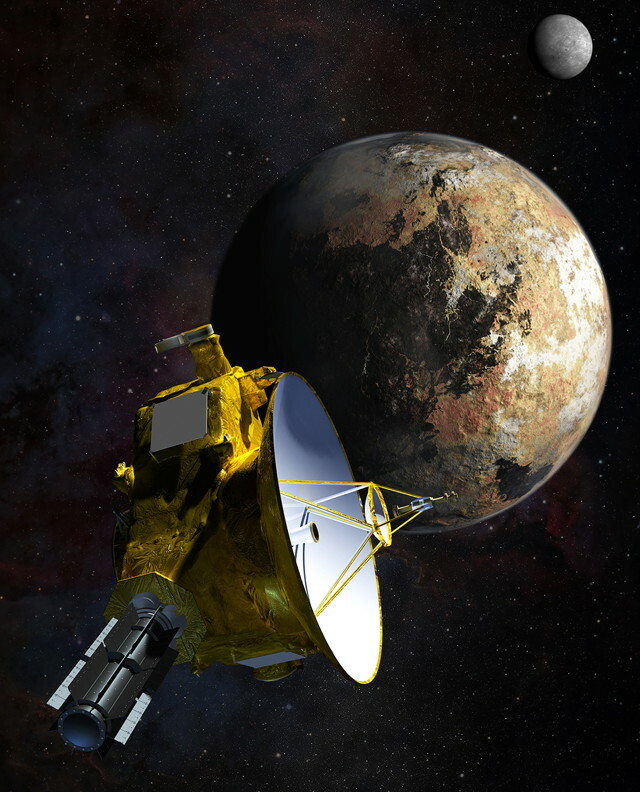 This entry was posted in Blog, Navigating Pluto, Spacecraft Navigation and tagged deep-space navigation, navigation, New Horizons, Pluto, solar system, Spacecraft, trajectory on 2015-07-11 by Black Sky Voyages. We are the Navigators. We say where we are and where we’re going. Where are we? As of midnight this morning, July 10th, we were 5.2 million kilometers away, eating up those remaining kilometers at the rate of 1.2 million a day. Where are we going? Pluto! To 12,550 kilometers above the surface, plus or minus a few, at the closest approach time of 7:48:49, July 14th, on the US east coast, plus or minus around 54 seconds or so (1-sigma). Of course we couldn’t know that for sure until the radio signal hits the ground about four-and-a-half hours later … if there were a radio signal. There won’t be because New Horizons will be looking at satellite Charon at that red-hot moment, with the antenna pointed away from Earth. Where were we? That’s in the past, we don’t particularly care. The most important thing is not where we’ve been but where we’re headed. And that’s the future, not the past. But if you have to know, we are from Earth, we are of the human race. Politicians should also be Navigators. They should tell us where the human race is, and where it’s going. But they don’t. Are we headed into a long-term presence in space, leading to colonies in the solar system and beyond? Or are we slouching toward overpopulation disasters like pollution, climate change, and nuclear Armageddon? They can’t tell us that because nobody knows. We are a chaotic, unorganized civilization with no Navigators to point the way, and little guidance to correct our trajectory. Meanwhile, back here on Earth, we have Crit 34 to worry about: Critical delivery number 34 of optical navigation data has just been delivered to us, hot from the spacecraft through the DSN (Deep Space Network), through a maze of data pipelines to our very own Optical Navigators in our big room at APL (the Applied Physics Laboratory) that we call The Bullpen. Our Optical Navigators have just finished calculating the centers of 2 Hydra, 3 Pluto, 3 Charon, and 2 Nix images taken yesterday, and now we, the rest of the Navigators on the team are going to combine that information with the rest of the Doppler and ranging data from the DSN and come up with an answer: When do we get to Pluto? The solution will shift by X seconds, with an uncertainty of Y, and we’ll report that to the project at large. Then the decision will be made: Will we tweak the already loaded sequence to accommodate the new results? The betting is that we will, since recent solutions have moved us earlier than the nominal arrival, and the error bars are shrinking down around those answers. We’ll know by the end of today. See Voyager at Neptune for the previous deepest space adventure of the far, far past. This entry was posted in Blog, Navigating Pluto, Spacecraft Navigation and tagged Charon, deep-space navigation, Hydra, navigation, New Horizons, Nix, Pluto, solar system, Spacecraft, trajectory on 2015-07-10 by Black Sky Voyages. As of today, Monday June 29th, I find myself airborne headed for the Applied Physics Laboratory in Maryland while 13 hours earlier, at midnight leading into this morning on the east coast, New Horizons found itself 18.5 million kilometers from Pluto and moving 1.2 million kilometers closer every day. The Dreaded Target-plane Drift has come and gone. 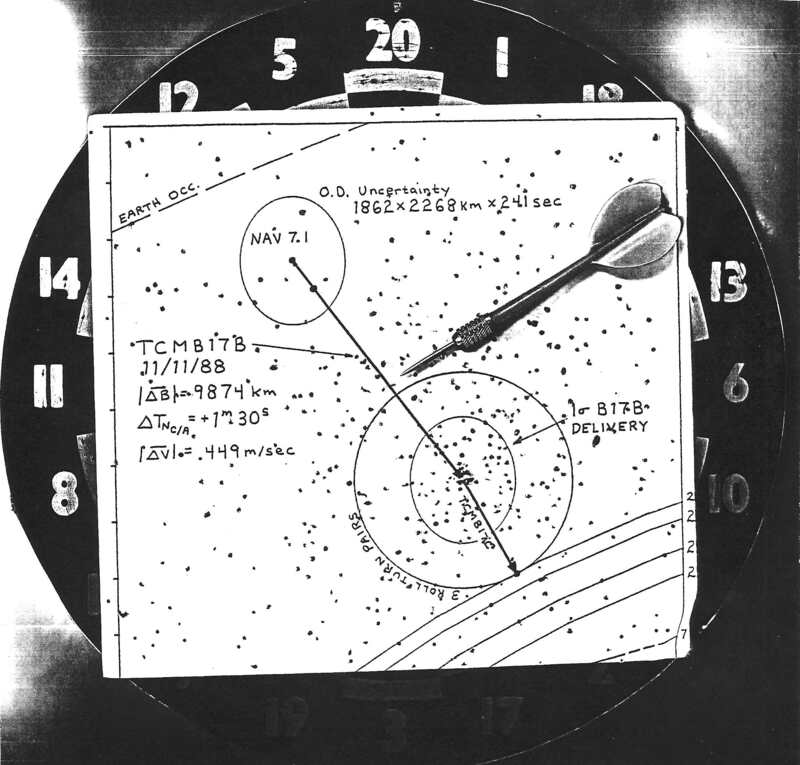 For about a week, the solutions drifted downward and leftward on the target plane—that big dart board in the sky—each time more tracking data was added, until finally it departed the bottom of the acceptable target box, a 300 x 200 kilometer rectangle centered about 14,000 kilometers down (Ecliptic south) and left (eastward) of Pluto. The cause of the Dreaded Target-plane Drift is not yet completely understood, although it’s almost certainly related to earlier errors in locating the centers of Pluto and Charon, and this was most likely caused by inadequate knowledge of the albedos of those bodies, the dark and light patterns covering their surfaces. It’s hard to model the surface brightness of a body you’ve never seen up close before. The DTpD, while it was in play, was a very worrisome thing because the Navigators didn’t know if it was real or—much worse—caused by a hidden problem, maybe serious dynamic mis-modeling that’s been overlooked to this point or even an unknown bug in the software. This caused some very restless activity and sleepless nights for several days in a row. It now appears that the drift has stopped and the current position, just outside the box, is correct and the earlier positions were not. There was probably not a dynamic mis-modeling problem or software bug. The moving finger of Navigation writes, and having writ, moves on. In any event, the Dreaded Target-plane Drift may be a thing of the past as the Navigators rely more on the pin-prick images of Styx, Nix, Kerberos, and Hydra. Those bodies are small enough that no appreciable diameters are yet seen and the albedos of their surfaces doesn’t even enter the problem. So … while the DTpD may never rear its ugly head again, the Navigation Team will not hold its collective breath. Eternal vigilance is the norm. At this red hot moment, if the current dart in the dart board is the correct one, surrounded by it’s little cloud of Gaussian-shaped probability, then the science observations won’t be completely optimal at closest-approach time, and the intended occultation of the Sun and Earth by Charon may not happen. Thus in the wee hours of tomorrow morning the penultimate maneuver, TCM17B1, will execute and move the drifted solution back into the box, the happy return of the prodigal son. It will cost a few centimeters per second change in velocity, and then all will be well. This entry was posted in Blog, Navigating Pluto, Spacecraft Navigation and tagged Applied Physics Laboratory, Charon, dart board, deep-space navigation, Kerberos, navigation, New Horizons, Nix, Pluto, Rosetta spacecraft, Spacecraft, Styx, trajectory on 2015-06-30 by Black Sky Voyages. Continuing the countdown, focusing on optical navigation using images of Pluto and the satellites. As of midnight this morning of June 23rd, Eastern time, we’re 25.4 million kilometers from Pluto and moving 1.2 million kilometers closer every day. The whole thing comes in a rush; time is not a leisurely independent quantity here—it’s relentlessly urgent! Another maneuver approaches fast: TCM17B1 executes in seven days, the next-to-last opportunity to correct errors before the flyby, and Navigation needs to come up with the “correct” trajectory ahead of that to support its design and implementation, a process that will take most of that seven days. Ideally new solutions wander around inside all the older ellipses as the newer ones shrink down around them. Lately INav has been holding fairly steady, but PNav dithers around, sometimes in, sometimes out of the ellipses computed only a day or so earlier. The game right now is to figure out which OpNav (Optical Navigation) modeling is correct, and which misleading. Pluto itself seems to be the problem. Images of Pluto, that is. Since we’ve never seen this Honorary Planet up close before, extracting an accurate estimate of its center from fuzzy optical data is as much art as science at the moment, and nobody will know what the real answer was until we actually get there and know all the Plutonian “blemishes” in detail; the craters and icy plains and mountains and scarps, and whatever else we find. going in the target plane. There are other models for center-finding too, and they’re also in the mix of experiments, all of them throws-of-the-dart to see where we come up relative to Pluto—all of them to see which ones we believe. INav seems to have avoided the problem up to now by the simple expedient of not using Pluto images at all and relying on images of its companion, Charon. Because Charon is smaller, it has smaller center-finding errors. 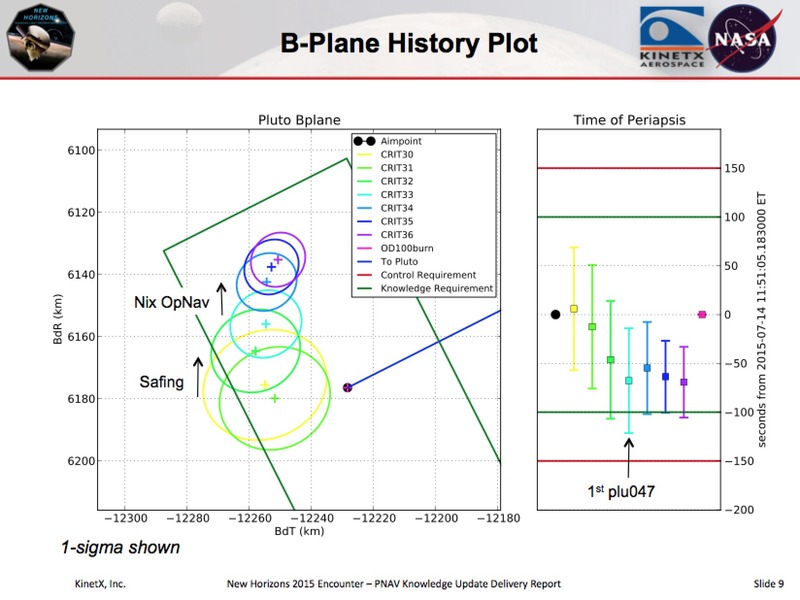 PNav is coming around to the same conclusion: Don’t trust Pluto! Fortunately, the smaller satellites Nix and Hydra are beginning to pop out of the optical wood-works, and because they are little more than specs in the images, mere pin-pricks of light, they will be much better located against the starry sky. After a while tinier Styx and Kerberos should become usable too. Ironically, the best information of where we’re going relative to Pluto is going to come from those satellite pin-pricks in the images, and not from Pluto itself. Meanwhile, I depart for Maryland Monday to become a small part of this Plutonian melee with whatever humble capacity I can bring—it’s been a long time since I’ve done this kind of interplanetary navigation, and the learning curve is extremely steep and precipitous. And meanwhile, nobody can stop the relentless march of time as Pluto expands in our vision and the activities grow more urgent. The pressure is on. This entry was posted in Blog, Navigating Pluto, Spacecraft Navigation and tagged Charon, deep-space navigation, Hydra, Kerberos, navigation, New Horizons, Nix, OpNav, Pluto, Spacecraft, Styx, trajectory on 2015-06-23 by Black Sky Voyages.